The New York magazine cover from October 31, 2016. 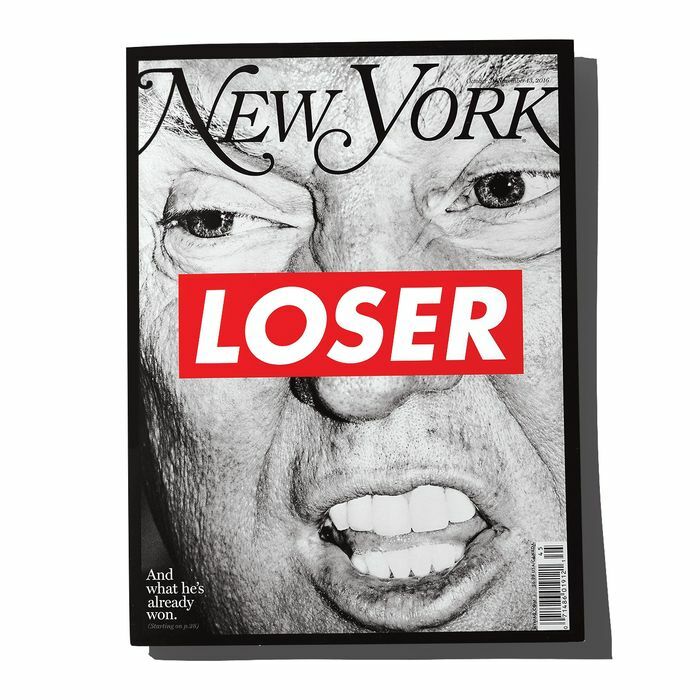 Our pre-election issue, with a cover by the American artist Barbara Kruger, went to press on Friday afternoon, October 28. That deadline came up just as FBI director James Comey made his announcement about a newly discovered cache of Hillary Clinton’s emails. Maybe Comey’s letter moved voters decisively away from Clinton or toward Trump; maybe it didn’t. But that was — at least according to polls that we no longer believe — the moment her momentum stalled. We, and Kruger, had always intended for our cover to convey multiple meanings: certainly that Trump was running behind, but also that America itself was losing, dragged down into a filthy dumb-show campaign. And, Kruger herself adds, “Donald Trump has a keen instinct for locating the most vulnerable place in the character of anyone who disagrees with him — my labeling him with the word he most feared was just a comment on and reenactment of that strategy.” (Not to mention that Trump himself uses single-word epithets so enthusiastically.) After a brief reconsideration that Friday, we stuck with our plan instead of scrapping it, with the knowledge that the cover would be seen by many readers only one way — as a prediction — even as we hoped that the power of the image transcended any one interpretation of its meaning. Since then, phone calls and social-media posts, particularly on the morning after the election, have made it clear that many readers couldn’t get past the “call”: Wrong, wrong, wrong, as Trump might say. We get that (although, c’mon, the idea that we somehow jinxed the election is beyond the pale). And even as we stubbornly maintain that the image is more complex than a certain notorious, erroneous headline from 1948, it is true that seeing the cover on the newsstand after Election Day makes us cringe — and that the vote turned an image meant to be provocative into one that perhaps feels hubristic instead. (That’s on us, by the way, not Kruger.) Obviously, in one critical sense, we were wrong. And now we can only hope that one of the cover’s other meanings — that this election has turned us all into losers, big-league — is wrong as well.